Remember when I wrote about the graphic violence in the first Last of Us Part II trailer last fall? Okay, I didn’t either—I found that piece while searching the game’s name on our site. Now that I’ve reread it I can say I still agree with it entirely, and that it also applies to the newer Last of Us Part II footage released at E3 this year. Ellie’s kiss with Dina might’ve dominated the conversation about The Last of Us Part II’s E3 demo, but it isn’t the only notable part of the 12 minute preview. That kiss fades into a sequence where Ellie fights off a group of cult members, and although there’s nothing as protracted or difficult to watch as the arm-breaking scene from the earlier footage, there are still a few shots that are more graphic than they need to be. 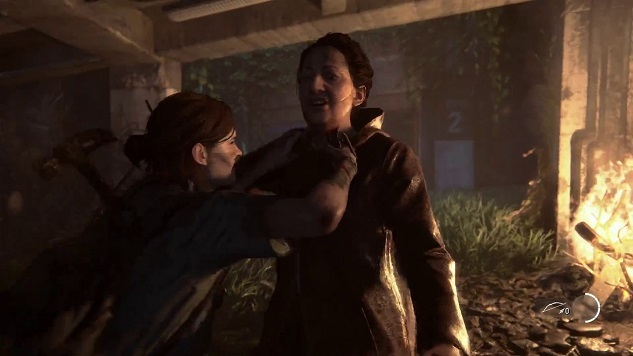 There doesn’t need to be a close up of Ellie’s machete hacking into a man’s throat to convince the viewer that this is a brutal and violent world. Is it okay for art to make me bored, though? Because the biggest drawback to the brutality we’ve seen from The Last of Us Part II so far is how familiar and tedious it all is. It’s every action game that thinks the only way to “comment” on our relationship with violence is to depict it in extreme detail, and it’s not far removed from every action game that just thinks it’s cool to splash gore across the screen. It’s every zombie movie or TV show we’ve seen over the last decade or two, with the fake blood budget of an old slasher film and the strained seriousness of prestige TV. It’s a game by smart, talented creators who seem less interested in challenging their audience than in indulging in the violence that is apparently expected from this medium, and that becomes ever more graphic and realistic as technology improves. The E3 footage at least shows the kind of personal relationships that gave the first game (which was also extremely violent) a level of depth rarely found in big budget blockbusters. It includes a character we know and care about in Ellie, and provides us a glimpse of how she’s grown in the years since we met her. Highlighting her kiss with Dina during the game’s big E3 demonstration takes a certain amount of confidence, but it would’ve taken even more confidence to not immediately follow that tenderness with savage displays of violence. She’s right. The first game did create a relatively believable version of a post-zombie world. If you didn’t play The Last of Us, that’s pretty much the one thing you know about it: this game is full of zombies and, thus, violence. And that’s another reason that there’s no need to focus so closely on that violence in demos and previews. This is a hostile and barbaric world they live in, but as this E3 footage also shows, they’re still living their lives in it, playing music and dancing and falling in love with each other. Why should we respect the brutality of their lives more than the beauty?